The ListPicker control in Silverlight for Windows Phone Toolkit (Feb 2011 release) has become famous after its poor performance. My app IP CAM Controller for example, starts from v1.6, I used ListPicker to accommodate the full list of supported camera types and brands. The total item number is about 20 to 30, while it took 3 to 5 seconds to get response when openning the setup page. It's really a huge lag. patch ID 9632, providing a brief summary in english. Good news for those lazy people (such as me ), I attached the compiled binary and source file base on Pedro's blog, feel free to download from here. Unzip the file and copy the two files (Microsoft.Phone.Controls.Toolkit.dll and Microsoft.Phone.Controls.Toolkit.pdb) to your Toolkit installation folder, e.g. 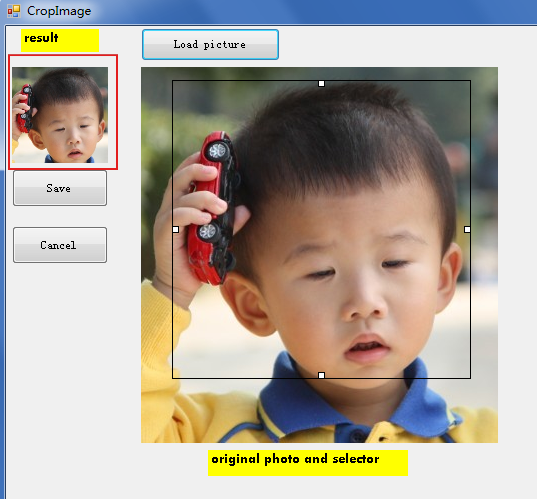 The rectangle with black border in the photo is the selector, while the image on the left is the target cropped photo. The selector could move or resize, but it couldn't smaller than 96*96. The original source code is from a Chinese website (I forgot which one now, sorry) and base on .Net Framework 1.1. It doesn't work probably at the beginning, I'm not sure if relates to the framework. I just fix some problems and make some changes to fit my needs. // // Insert code here.